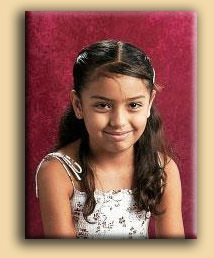 The picture you see to the left is of a precious child named Brisenia Flores. She beams an awkward little smile for the photographer that is common in children of that age. But unlike other children, Brisenia will never again flash that beautiful smile to a photographer, or to anyone else for that matter. That is because on March 30 of this year, Brisenia, who was nine years old at the time, was murdered in her home by armed members of a right-wing paramilitary group. Right-wing militias, deaths squads and other paramilitary organizations were relatively common in Latin America during the tumultuous 1980s, and their horrendous crimes and history of cruel human rights abuses are well known and have been extensively documented by human rights groups. What makes Brisenia's murder different isn't just that the crime ocurred more recently, but that it ocurred on American soil, and that the violent paramilitary organization that murdered her while she recoiled and wept, pleading for her life, was an American terrorist organization known as the Minutemen American Defense organization, a group whose founder, Shawna Forde, has well established ties to larger and better known anti-immigrant groups such as the Minutemen and FAIR, the Federation For American Immigration Reform (Forde once claimed to be a spokesperson for FAIR on television, though that group denies she was a member). I did not personally know Brisenia or her family, but reading of the crime moved me deeply. The American political scene has of late been dominated by a dark and dangerous undercurrent of nativist, anti-immigrant demagoguery served up by irresponsible propagandists such as CNN's Lou Dobbs and Fox New's Bill O'Reilly and race-baiting politicians such as U.S. Congressman Tom Tancredo among many, many others. As a Chicano this vicious hate-mongering concerns me personally. We are a nation of immigrants who ourselves bear the mark of Cain for the crimes our ancestors committed against the original inhabitants of this land. The discussion of any issues and concerns that might arise from the flow of people and goods accross our nation's Southern border should not and cannot be left solely to the dark voices of hatred and divisiveness that daily pollute our radio waves and cheapen our political discourse. "Give me your tired, your poor,your huddled masses yearning to breathe free,the wretched refuse of your teeming shore. Send these, the homeless, tempest-tost to me, I lift my lamp beside the golden door!" Perhaps this way Brisenia's tragic, untimely death will not have been wholly in vain.